One of the more noted recent trends in rebel dynamics in Syria is the weakening of the Islamic Front, widely noted last year as the most powerful rebel alliance in terms of manpower and fighting capabilities. However, the coalition was always weaker than it seemed at first sight, with one of the most pertinent questions being why the constituent groups never abandoned their own individual names and banners if they were really so united. This year, the Islamic Front has seen its constituents- particularly Ahrar al-Sham- hit by defections to the Islamic State (IS), assassinations of leaders, and fracturing on account of tensions between and within the coalition’s factions. 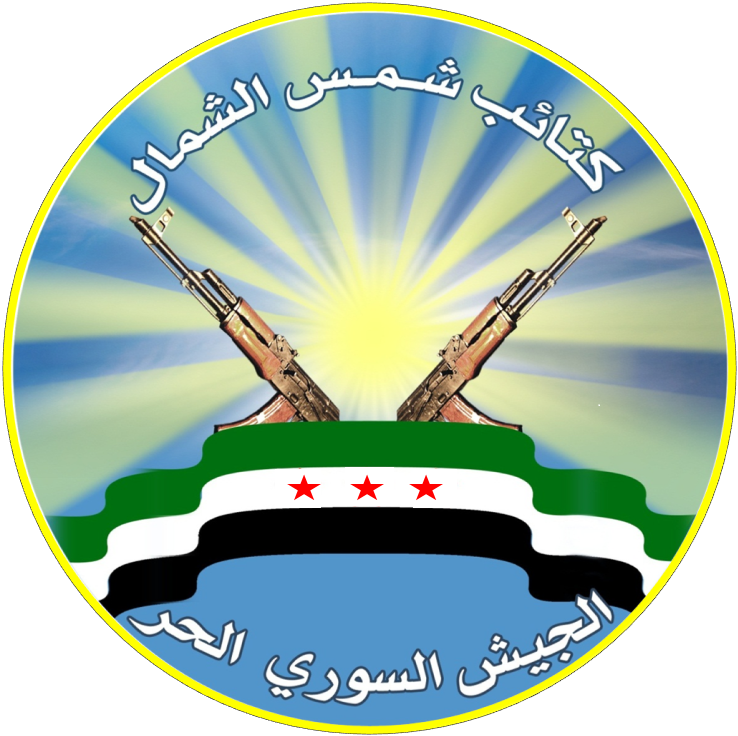 The group Liwa al-Tawheed- previously considered one of the most powerful Aleppo factions- has suffered from internal fragmentation and manpower loss, with many of its local eastern Aleppo province affiliates having become defunct but now re-emerging as break-off groups, lacking any distinct ideological program equivalent to the Islamic Front’s “Project of the Ummah” that aimed for a clear assertion of the Islamic Front as a serious Islamist political force to be reckoned with. 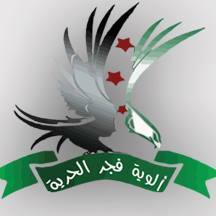 The new rebel coalition Tajammu’ Alwiya Fajr al-Hurriya (‘Grouping of the Dawn of Freedom Brigades’) is a case-in-point. For example, one of the constituents of this coalition is Kata’ib Shams al-Shamal (‘Sun of the North Battalions’), whose official Facebook page ‘likes’ a page set up for the Manbij Martyrs’ Battalion, a one-time Liwa al-Tawheed affiliate in the town of Manbij that has since January of this year fallen under the exclusive control of the IS, having previously been a place where IS was merely one of a number of groups in the town including local Islamic Front groups’ affiliates. This points to the link between the Kata’ib Shams al-Shamal formation and the now defunct Liwa al-Tawheed affiliates it has come to supersede in the northeast of Aleppo province. 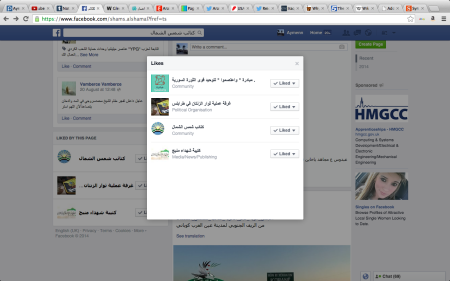 The Facebook ‘likes’ of Kata’ib Shams al-Shamal, including the Manbij Martyrs’ Battalion. The Dawn of Freedom Brigades coalition is of importance at the moment because it is a participant in the fight against IS in the Kobani (Ayn al-Arab) area (e.g. see this video, said to be in the countryside just to the south of the main town) that is one of the Kurdish Democratic Union Party’s (PYD) self-declared autonomous cantons. The coalition is thus cooperating with the PYD’s armed wing the People’s Protection Units (YPG). This cooperation, as will be seen below, is something openly admitted: compare with this video* announcing the “Euphrates Volcano” joint operations room including Kata’ib Shams al-Shamal and the YPG for eastern Aleppo countryside to fight IS. This pointedly contrasts with last year’s dynamics that saw the parent organization Liwa al-Tawheed work with IS against the YPG in Aleppo province, in part contributing to severe losses for the YPG in that area. Such coordination with IS- following on from the YPG’s expulsion of IS and Jabhat al-Nusra from Ras al-Ayn town in Hasakah province in mid-July- was also undertaken by other major rebel groups like Ahrar al-Sham. It was justified by many rebels at the time as necessary against a perceived ‘regime agent’ but was also rooted in wider Syrian Arab suspicion of Kurdish autonomy or separatist agendas. 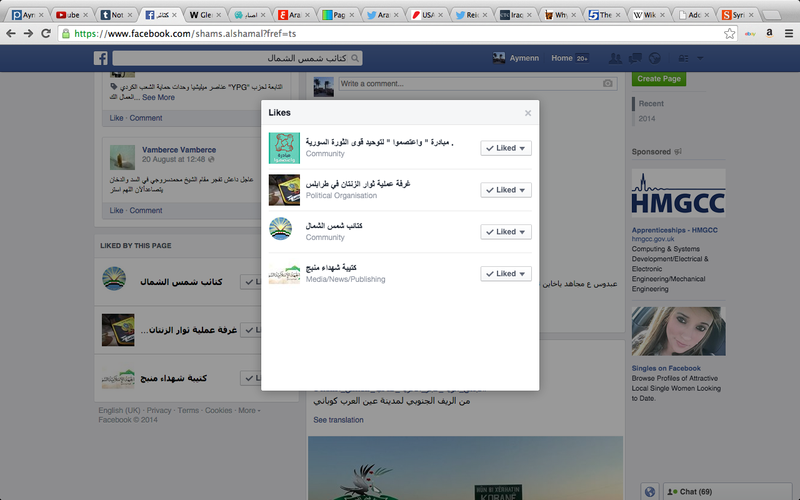 Undoubtedly the cooperation between IS and these rebel groups against the YPG allowed IS to grow. To be sure, relations somewhat shifted at the start of this year as infighting broke out between IS and rebel groups across northern and eastern Syria: limited cooperation, for instance, was in evidence between Liwa al-Tawheed and Jabhat al-Akrad- a front-group for the YPG- in the Azaz countryside, but there was nothing on a par with rebels helping the YPG to defend a stronghold under PYD control. The current Dawn of Freedom Brigades-YPG effort in Kobani needs to be tied to a broader trend of some FSA-banner figures coming to terms with past mistakes vis-a-vis relatons with the YPG: foremost embodied in one-time Aleppo FSA Military Council head Col. Oqaidi’s visit to the YPG in the Kurdish enclave of Afrin in Aleppo province in late August, reflecting a 180 degree turn from his defences of IS and anti-YPG stance in summer 2013, even as he goes on about the need for unity against the niẓam (‘regime’). In my view, however, this cooperation is too little, too late to lead to substantial setbacks for IS, hindered as it is also by Turkey’s hostility towards the PYD on account of links with the Kurdistan Workers’ Party (PKK) and Western regard for such concerns. In the long-run too, there is a problem of differing agendas: the PYD has too little interest or resources to attempt to take the fight all the way to Raqqa city, for example, being more concerned with its own proto-state project in the territory it already controls. Below is an interview I conducted with Abu al-Layth, one of the leaders of the Dawn of Freedom Brigades (see here for the Dawn of Freedom Brigades’ organizational structure). Q: What are the factions in the Dawn of Freedom Brigades? Is it true that the factions used to be in Liwa al-Tawheed? Q: What are your aims? Do you want a democratic state or a state in which Shari’a is the sole source of legislation? Q: With protection for all sects? A: The people decides and we came out because of the racism of Bashar al-Assad. Q: Is there cooperation with the YPG in the Ayn al-Arab area against the IS organization? A: Yes. We of the Dawn of Freedom Brigades- when IS launched the assault on Ayn al-Arab- sent 250 fighters to Ayn al-Arab to protect the Kurdish and Arab people in this area. And we have tried to protect the Suleyman Shah tomb**** but we will not be able to do so because of the paucity of our heavy equipment. Q: In your opinion are the American airstrikes helping the effort against IS? A: This is in God’s hands. We are against the coalition’s airstrikes because they do not target the regime which is greatly criminal. The two states [i.e. IS and the regime] compete as to who can destroy civilian life more. Q: And is it a problem also that the strikes are targeting Jabhat al-Nusra that fights the regime? A: No. Jabhat al-Nusra fights on all sides, but has also yielded on more than one of the fronts between it and the regime. ***** Examples: the battle of Kassab; it and Ahrar al-Sham of the battle of Hama recently; it and the Islamic Front in the battle of the Industrial Area in Aleppo. I mean they have many bad things about them as well. And we as a Syrian people don’t accept any organization that is neutral or against our people. Q: So the Islamic Front also withdrew from the Industrial Area in Aleppo? A: The reason being the weakness of the two fronts [Nusra & the Islamic Front], so the regime seized the Industrial Area. Weakness and not withdrawal: I mean retreat. *- Others mentioned in the video include brigades that have been working with the YPG for several months now following IS’ takeover of all major urban areas in Raqqa province, such as Liwa Thuwar Raqqa (ex-Nusra affiliate) and Liwa al-Jihad fi Sabeel Allah (tied to the Western-backed SMC). The cooperation originates from the fact that many members of these groups sought refuge with the YPG west of Tel Abyad. The YPG would then help these groups to reclaim some villages from IS in return for power-sharing in those localities. **- Referring to the lack of real unity and direction with the Islamic Front. ***- The mark of a non-ideological program, also contrasting with the “Project of the Ummah” of the Islamic Front from which the Dawn of Freedom Brigades coalition has emerged. ****- The site has been under the protection of Turkish troops and IS allegedly threatened an attack in March this year if they did not withdraw within 3 days, though even if the threat had been real, it was never acted on. *****- cf. Aron Lund’s article on Jabhat al-Nusra, which notes also the consolidation of control of towns and territory in Idlib province that have followed on from at least some withdrawals. Straight out of the Assad regime’s playbook! But ISIS can’t matched the regime’s use of airstrikes against civilians, barrel bombing, urban destruction, mass imprisonment and death under torture, and “punishment” by mass starvation of civilians. I had been waiting to read any news report on the massacre of children on the Western media. I heard nothing except two or three small pieces of news scattered around and brushed over only after a crowd of hundreds of pro-government people were reported protesting the government because of the bombing. Dutifully fulfilling his job, Ban Ki- moon condemned “in the strongest terms” deadly bomb attacks on children. But even that news was only reported on Xinhuanet in China. So my waiting turned into resenting and cursing. Are those MSM people supposed to report the enormity and true crime against humanity by their professional training and on moral ground? Are those so-called world leaders supposed to feel “their consciences shaken” as they have claimed they had felt and openly expressed after ISIS’ beheading. It is no surprise that we do not hear anything from those hypocrites when people and children were massacred if they happen to be from the side that the western government is against, just as we have seen what happened to Serbs in the 90s. The truth is that the barbarian “opposition” is still supported by the west and Goats of CC and the sleazy Turkey; therefore, that lowest form of human scums and its monstrosity debasing itself further can get away from condemnation and rejection from the genuine human conscience. Worst of all, people of conscience are even oblivious to the infamy because they have been either blocked to the truth or fed by garbage. The video, documenting (now former) U.S. Ambassador Robert Ford’s visit to FSA Col. Abdel Jabbar al-Okaidi in Northern Syria, also shows the same Col. Okaidi celebrating with and praising a well-known ISIS commander, Emir Abu Jandal, after conducting a joint operation. In an interview, the U.S. “key man” at that time (2013), through which U.S. assistance flowed, also praises ISIS and Al-Qaeda as the FSA’s “brothers.” The video further shows Okaidi proudly declaring that al-Nusra (Al-Qaeda in Syria) makes up ten percent the FSA. I posted a video on the thug named Aqidi on this blog. The FSA’s biggest problem has been internecine feuding. Over the past two years, I’ve interviewed various people who tried to become leaders, such as: Abdul-Jabbar Akaidi, Salim Idriss and Jamal Maarouf. They all talked about unifying the opposition but none succeeded. An Arab intelligence source explains: “Until now, the FSA is a kind of mafia. Everyone wants to be head. People inside Syria are tired of this mafia. There is no structure. It’s nothing.” And this from one of the people who have struggled the past three years to organize the resistance. Sorry to disappoint you “Apple-Mini”, click here and here! Try using a good search engine properly! I actually cannot find ANY US media outlet that has NOT reported the Homs massacre. Apple_Mini, which network/newspaper/blog/media_outlest/etc., you DID NOT find the story on? Message to those using events in Syria as a chance to spew their obsessive conspiracy theories or push Assad regime lies. “sigh, the 2011 Syrian revolution/protests (arab spring) were not part of a usa plot, they were begun by ordinary people out of Homs, they gathered and protested and requested more freedom, reform, they were not even calling for Assad to go, but then the gov began killing the protesters and so they asked for help from the west they wanted a no-fly zone to stop themselves being killed, the usa and the west did nothing. And so they protested alone without help from anyone, and as they did they were rounded up and killed by Assad and his government. It was only then that they began to call for Assad to go, it was only then that they began to take up arms. There was no plot. Here is the FB page from Homs complaining about the lack of sympathy from the regime TV about their plight. منذ قليل .. الفضائية ﺍﻟﺴﻮﺭﻳﺔ ﺗﻜﺮﻡ ﺷﻬﺪﺍﺀ ‫#‏مجزرة_عكرمة‬ ﺑﺴﻬﺮﺓ ﺯﺟﻞ ﻋﻠﻰ ﻛﻴﻒ ﻛﻴﻔﻜﻮﻥ ..
Biden was probably not available to comment on that? “The terrorism case against former Guantánamo inmate Moazzam Begg collapsed after MI5 belatedly gave police and prosecutors a series of documents that detailed the agency’s extensive contacts with him before and after his trips to Syria, the Guardian has learned. The same sort of relation between the British intelligence existed with the Nigerian who slaughtered a soldier in London streets just one or two years ago. He was a follower of one of the ultra Salafi Lebanee shaykh if I remember correctly, isn’t it? Moderate rebels fired 2 moderate rockets at Latakia, a man, his wife and their child were moderately killed. ذكر المرصد السوري لحقوق الإنسان أن قوات الأسد تقدمت، اليوم الجمعة، في حلب، كبرى مدن الشمال السوري، مهددة بفرض حصار كامل على القطاعات التي تسيطر عليها المعارضة المسلحة في المدينة. ونقلت وسائل الإعلام السورية الرسمية عن مصدر عسكري قوله إن “وحدات من الجيش والقوات المسلحة تحكم سيطرتها على قرى وتلال تلة المضافة وتلة فيفان وحندرات ونقطة الرابع مفارق غرب سيفان في ريف حلب الشمالي، وتقضي على أعداد كبيرة من الإرهابيين”. ومن جهته، أوضح المرصد أن قوات النظام وعناصر من حزب الله سيطروا خصوصا على قرية حندرات والتلة التي تحمل الاسم نفسه. وتشرف هذه التلة على طريق الإمدادات باتجاه المناطق التي يسيطر عليها مقاتلو المعارضة في حلب. وأضاف أن مقاتلي المعارضة أرسلوا تعزيزات إلى حندرات حيث تدور معارك عنيفة. وقال مدير المرصد، رامي عبدالرحمن، لوكالة “فرانس برس”: “إذا تمكن الجيش من إبقاء سيطرته على تلة حندرات يمكنه قطع وصول الإمدادات” إلى مقاتلي المعارضة. The United Arab Emirates and Qatar are locked in a propaganda war with public relations agencies and front organisations as proxies that is backfiring on both Gulf states. Disclosures of the proxy war have hit Qatar at a time that its image as the host of the 2022 World Cup is under renewed fire. In contrast to Qatar, the UAE has sought to counter revelations about its efforts to shore up its image through the creation of a network of human rights groups and negatively influence international media coverage of Qatar by touting the fact that its lead fighter pilot in allied attacks on ISIS (Islamic State of Syria and Sham), the jihadist group that controls a swath of Iraq and Syria, is a woman…. Though everyone adheres to Washington and its Gulf allies’ anti-terrorist discourse, everyone understands that it is only a rhetorical justification for a war that has other purposes. The United States say they want to destroy the Islamic Emirate which they created and which performs for them the ethnic cleansing necessary to its plan for the remodeling of the “Broader Middle East”. Stranger still, they say they want to fight in Syria alongside the moderate opposition which is composed of the same jihadists. Finally, they destroyed Rakka buildings that had been evacuated two days earlier by the Islamic Emirate. For Thierry Meyssan, behind these apparent contradictions the gas war continues..
Iran is already controlling Lebanon, Syria, Irak and Yemen, and Israel is not worried at all. Why? Because the hidden agenda is opening all doors to Iran to control the arab lands. Iran, US, Assad and Israel seem to work together. هــل الــوزير الــزعبي يشاهــد اعلامــه !! وسـام الطيـر | يقول مواطن حمصي لدى سؤاله عن الإعلام السوري ( طظ بهيك إعلام و*** على هيك إعلام ,, إعلام *** وإعلام **** …..) فالجميع يسب ويشتم هذا الإعلام الذي بات يبتكر أساليب إغاظة وقهر الشعب السوري بإدارة فاشلة تعود للستينات أو الخمسينات وبعيدة كل البعد عن الشارع السوري . أكثر من 40 طفلاً استشهدوا في حي عكرمة بحمص لم يحترم إعلام الزعبي طهارة أجسادهم وأرواحهم بمسلسلات المسخرة وعيلة خمس نجوم وست نجوم ومسلسلات المياعة والمسخرة التي لا تناسب فترتنا الحالية بالمطلق ! “سهرة زجل” بالله عليكم ألا تستحون أن تعرضوا حفلة زجل ورقص ودبكة منتصف الليل وعشرات الأطفال في حمص لم يمضِ ساعات على دفنهم تحت التراب ومئات الجرحى الآخرون في المشافي يصارعون الموت ,, ما شعور الحماصنة وهم يشاهدون حفلات الزجل على إعلام الزعبي ودموعهم لم تجف بعد ! مشهد آخر عندما كانت مراسلة الأخبار تعد تقريراً في حمص عن الأطفال الشهداء ليلتف المئات حولها ويهتفون “الشعب يريد إسقاط المحافظ” وتلتقي بأهالي حمص الذين طالبوا بمحاسبة المحافظ وصدف وجود أحدهم الذي صور بجواله مايدور حول المراسلة من مظاهرات ومطالب وانتشر الفديو على مواقع التواصل الاجتماعي و انتظر الجميع هل سنشاهد ماصوروا في حمص على الشاشة !! Care to explain why the regime did not bomb these terrorist sites and chose instead to bomb bakeries, markets, and residential areas in Aleppo? Incompetence, ignorance or something else? Assad always like to say that the US/West do not know facts on the ground in Syria and the region. Looks like the US knew more than he did? Here is a tragic event that truly unified all Syrians for the first time in a long time. Everyone I know condemned it in the strongest terms. And yet Assad and his cronies ignore it and won’t even dignify it with an appearance, a statement or a mention. How about think of it as a serious security breach in an area that is supposedly well-secured? Anyone got fired? Last week, the head of security at the white house resigned (after 30 years of service) because one guy jumped the walls of the white house. To borrow from my favorite Ghufran’s quote, Tiz feekon wa fi hal-daouleh and hal-raees. My apologies. I use the term “Daouleh” to mean something else. Let me rephrase: Tiz fi hal-hokoomeh wa fi hal-raees. The U.K.-based Syrian Observatory for Human Rights said Friday that a truce was signed between “moderate” and Islamic Syrian rebels and ISIS in Hajar al-Aswad, a Syrian city in the Darayya District that was previously the scene of intense clashes. According to SOHR, “the two parties will respect a truce until a final solution is found and they promise not to attack each other because they consider the principal enemy to be the “Nussayri regime” of Syria’s President Bashar al-Assad. The deal was first reported by Arabic news media outlets and by Agence France Presse. I agree that our Toz should not be limited to thawrajiyyeh and rebels but they are the ones who sold Syrians and the world the lie that they are the cure for the regime ills. Come on and run behind those killers, follow them to Azerbaijan, Kazakhstan, Kyrgyzstan, Tajikistan, Tatarstan, Pakistan and Afghanistan after completes training them in Georgia and Pakistan (Areas vital work of CIA and Mossad ), and do not forget take them with yourself to the hell. And also to all the good peopl on this site. If we should vote for one of Ghufran’s maxims, I would say that Ya umma dahakat min jahliha al-umam is the best. and with that being said and after the good wishes were sent, I have to go back to business as usual. Rebels threw more rockets at residential areas in Syria to celebrate Eid, boneheads pro rebels “think tanks” are supposed to be marginally embarrassed at least but those tanks have lost he ability to think and are now the prisoners of their own hatred, the fuel that keeps the sinful car of war running. Childish pathetic fantasists. Playing games to make their d*cks feel bigger. And here are the clown “holy warriors”, their d*cks feeling big as they feast in fancy restaurants and play in luxury hotel pools in Raqqa while the townspeople struggle in worsening conditions with collapsed services and basic food items becoming unaffordable. ISIS is using images of their elite lifestyle in (stolen) comfortable homes and upmarket cars in Raqqa and other places as a recruitment tool. (Aping – like an ape, imitating (someone or something), in an absurd or unthinking way). Dear SYRIAN #32 thank you and I return your greetings warmly. It makes me glad to see the list of good guys you give here. But also sad, because there used to be so many more terrific contributors on SyriaComment. They fled as this forum’s been deliberately wrecked and soiled in the past couple of years by unchecked waves of Assadist propagandists (most recently, the team posting as “ALAN”). I always look for posts from all those you list, as well as ANNIE and JUERGEN and OMEN and a couple of others. But this forum is badly missing the comments from TARA and SYRIAN HAMSTER and MAJEDKHALDOUN. Is shaken one hair of your head toward the sheer scale of destruction in the Gaza Strip and the assassination of Palestinian Childhood? hypocrite? Thanks for the Eid Greetings. Khair Mubarak. Eid Mubarak to all. Wish you a happy, joyous, peaceful and blessed ocassion and an end to suffering and a quick return to peace, security, freedom and dignity. Bully for you in your greeting everyone. Apparently such a culture lacking in congratulating above! Rebels in Aleppo city are trying to break the fire circle built by advancing Syrian army troops, if their efforts fail they will have no choice but to sign a cease fire agreement where foreign fighters leave and Syrian fighters give heavy weapons and participate in protecting the city against ISIS and domestic criminals. On the subject of SC “losing” commentators, the reason is simple, there was a euphoria when toppling the regime was a real possibility but that euphoria had evaporated and was replaced by the thick cloud of Islamist terrorism which now covers most of rebels fighting force, Syrians and non Syrians alike did not forget the sins of the regime but they are not willing to give rebels another chance, 3 years and 7 months were more than enough. you can not make chicken soup out of chicken poop. In Syria, US bombs are now killing Syrian civilians, destroying infrastructure and all while violating the sovereignty of the nation of Syria itself. The act of military aggression the US and its partners are exercising in Syria run contrary to the UN Charter itself and constitute a grave infraction of international law. When the UN ponders the steady erosion of its legitimacy, popularity and effectiveness, it is displays of double standards like those seen in Syria that are the cause. When international law is cited and enforced selectively by certain member states of the United Nations, using the UN itself as a platform to legitimize otherwise illegal actions, the world teeters on the edge of global lawlessness leaving the remaining members of the UN to ponder alternatives in resolving injustices perpetuated rather than challenged by the UN and its Charter. The Syrians are left with little other choice than to act unilaterally themselves to defend their territory and people as well as their interests in the face of rogue nations that have apparently co-opted and now control much of the UN. Israel gives cover and opened a corridor for Jabhat al-Nusra along the Golan height demarcation line to reach south Lebanon and the southern approaches to Damascus. ISIS has been trained by US Special Forces in Georgia. They’ve recruited Chechens as soldiers, they trained them in secret NATO bases inside Turkey and Jordan. For the last year and a half, they have been developing what we now call ISIS (IS, ISIL or DASH) or whatever moniker you want to give it. It’s all made in Langley, Virginia (the CIA’s seat) and by the affiliates of Langley inside the Pentagon. SO … Feline magician Joe Biden: you can shut up your f**n mouth! Kobane genocide as US just watches with its airforce is proof US is in bed with ISIS,punishing those who disobeyed US&ISIS..